Mater de Mercede: "...Religion does not represent a problem for society..."
"...Religion does not represent a problem for society..."
As a new year begins, our own hearts and the entire world continue to echo the joyful message proclaimed twenty centuries ago in the night of Bethlehem, a night which symbolizes humanity's deep need for light, love and peace. To the men and women of that time, as to those of our own day, the heavenly hosts brought the good news of the coming of the Saviour: "The people who walked in darkness have seen a great light; those who dwelt in a land of deep darkness, on them has light shined" (Is 9:1). The mystery of the Son of God who became the son of man truly surpasses all human expectations. In its absolute gratuitousness this saving event is the authentic and full response to the deep desire of every heart. The truth, goodness, happiness and abundant life which each man and woman consciously or unconsciously seeks are given to us by God. In longing for these gifts, each person is seeking his Creator, for "God alone responds to the yearning present in the heart of every man and woman" (Post-Synodal Apostolic Exhortation Verbum Domini, 23). Humanity throughout history, in its beliefs and rituals, demonstrates a constant search for God and "these forms of religious expression are so universal that one may well call man a religious being" (Catechism of the Catholic Church, 28). The religious dimension is an undeniable and irrepressible feature of man's being and acting, the measure of the fulfilment of his destiny and of the building up of the community to which he belongs. Consequently, when the individual himself or those around him neglect or deny this fundamental dimension, imbalances and conflicts arise at all levels, both personal and interpersonal. This primary and basic truth is the reason why, in this year's Message for World Day of Peace, I identified religious freedom as the fundamental path to peace. Peace is built and preserved only when human beings can freely seek and serve God in their hearts, in their lives and in their relationships with others. Ladies and Gentlemen, your presence on this solemn occasion is an invitation to survey the countries which you represent and the entire world. In this panorama do we not find numerous situations in which, sadly, the right to religious freedom is violated or denied? It is indeed the first of human rights, not only because it was historically the first to be recognized but also because it touches the constitutive dimension of man, his relation with his Creator. Yet is this fundamental human right not all too often called into question or violated? It seems to me that society, its leaders and public opinion are becoming more and more aware, even if not always in a clear way, of this grave attack on the dignity and freedom of homo religious, which I have sought on numerous occasions to draw to the attention of all. Looking to the East, the attacks which brought death, grief and dismay among the Christians of Iraq, even to the point of inducing them to leave the land where their families have lived for centuries, has troubled us deeply. To the authorities of that country and to the Muslim religious leaders I renew my heartfelt appeal that their Christian fellow-citizens be able to live in security, continuing to contribute to the society in which they are fully members. In Egypt too, in Alexandria, terrorism brutally struck Christians as they prayed in church. This succession of attacks is yet another sign of the urgent need for the governments of the region to adopt, in spite of difficulties and dangers, effective measures for the protection of religious minorities. Need we repeat it? In the Middle East, Christians are original and authentic citizens who are loyal to their fatherland and assume their duties toward their country. It is natural that they should enjoy all the rights of citizenship, freedom of conscience, freedom of worship and freedom in education, teaching and the use of the mass media" (Message to the People of God of the Special Assembly for the Middle East of the Synod of Bishops, 10). I appreciate the concern for the rights of the most vulnerable and the political farsightedness which some countries in Europe have demonstrated in recent days by their call for a concerted response on the part of the European Union for the defence of Christians in the Middle East. Finally, I would like to state once again that the right to religious freedom is not fully respected when only freedom of worship is guaranteed, and that with restrictions. Furthermore, I encourage the accompaniment of the full safeguarding of religious freedom and other humans rights by programmes which, beginning in primary school and within the context of religious instruction, will educate everyone to respect their brothers and sisters in humanity. Regarding the states of the Arabian Peninsula, where numerous Christian immigrant workers live, I hope that the Catholic Church will be able to establish suitable pastoral structures. Another sign of the marginalization of religion, and of Christianity in particular, is the banning of religious feasts and symbols from civic life under the guise of respect for the members of other religions or those who are not believers. By acting in this way, not only is the right of believers to the public expression of their faith restricted, but an attack is made on the cultural roots which nourish the profound identity and social cohesion of many nations. Last year, a number of European countries supported the appeal lodged by the Italian government in the well-known case involving the display of the crucifix in public places. I am grateful to the authorities of those nations, as well as to all those who became involved in the issue, episcopates, civil and religious organizations and associations, particularly the Patriarchate of Moscow and the other representatives of the Orthodox hierarchy, as well as to all those - believers and non-believers alike - who wished to show their sympathy for this symbol, which bespeaks universal values. Acknowledging religious freedom also means ensuring that religious communities can operate freely in society through initiatives in the social, charitable or educational sectors. Throughout the world, one can see the fruitful work accomplished by the Catholic Church in these areas. It is troubling that this service which religious communities render to society as a whole, particularly through the education of young people, is compromised or hampered by legislative proposals which risk creating a sort of state monopoly in the schools; this can be seen, for example, in certain countries in Latin America. Now that many of those countries are celebrating the second centenary of their independence - a fitting time for remembering the contribution made by the Catholic Church to the development of their national identity - I exhort all governments to promote educational systems respectful of the primordial right of families to make decisions about the education of their children, systems inspired by the principle of subsidiarity which is basic to the organization of a just society. 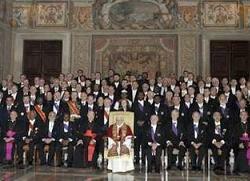 Ladies and Gentlemen, on this solemn occasion, allow me to state clearly several principles which inspire the Holy See, together with the whole Catholic Church, in its activity within the intergovernmental International Organizations for the promotion of full respect for the religious freedom of all. First, the conviction that one cannot create a sort of scale of degrees of religious intolerance. Unfortunately, such an attitude is frequently found, and it is precisely acts of discrimination against Christians which are considered less grave and less worthy of attention on the part of governments and public opinion. At the same time, there is a need to reject the dangerous notion of a conflict between the right to religious freedom and other human rights, thus disregarding or denying the central role of respect for religious freedom in the defence and protection of fundamental human dignity. Even less justifiable are attempts to counter the right of religious freedom with other alleged new rights which, while actively promoted by certain sectors of society and inserted in national legislation or in international directives, are nonetheless merely the expression of selfish desires lacking a foundation in authentic human nature. Finally, it seems unnecessary to point out that an abstract proclamation of religious freedom is insufficient: this fundamental rule of social life must find application and respect at every level and in all areas; otherwise, despite correct affirmations of principle, there is a risk that deep injustice will be done to citizens wishing to profess and freely practise their faith. Before this distinguished assembly, I would like once more to state forcefully that religion does not represent a problem for society, that it is not a source of discord or conflict. I would repeat that the Church seeks no privileges, nor does she seek to intervene in areas unrelated to her mission, but simply to exercise the latter with freedom. I invite everyone to acknowledge the great lesson of history: "How can anyone deny the contribution of the world's great religions to the development of civilization? The sincere search for God has led to greater respect for human dignity. Christian communities, with their patrimony of values and principles, have contributed much to making individuals and peoples aware of their identity and their dignity, the establishment of democratic institutions and the recognition of human rights and their corresponding duties. Today too, in an increasingly globalized society, Christians are called, not only through their responsible involvement in civic, economic and political life but also through the witness of their charity and faith, to offer a valuable contribution to the laborious and stimulating pursuit of justice, integral human development and the right ordering of human affairs" (Message for the Celebration of World Peace Day, 1 January 2011, 7). May no human society willingly deprive itself of the essential contribution of religious persons and communities! As the Second Vatican Council recalled, by guaranteeing just religious freedom fully and to all, society can "enjoy the benefits of justice and peace which result from faithfulness to God and his holy will" (Dignitatis Humanae, 6). Book review: "The Closing of the Muslim Mind"